If you’re looking for a flattering and versatile skirt for the office I would have to suggest the pencil skirt. Whether you pair it with a feminine blouse or masculine shirt, have it tucked in, or paired with a matching blazer a pencil skirt will always look stylish, if worn correctly. You might be wondering what to wear with a pencil skirt and there are a variety of ways a pencil skirt can be styled but today we’re going to discuss how to wear it to work. 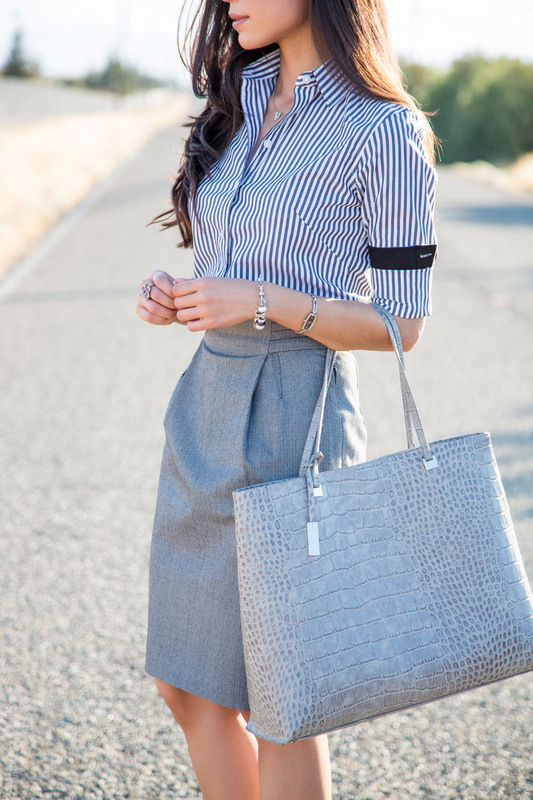 In this outfit I paired the gorgeous gray pencil skirt with a striped button down with contrasting cuffs. The thin vertical lines in the skirt look great against the thicker, bolder stripes on the blouse. When combining two striped pieces such as this make sure the stripes are different in size as it will keep the outfit from looking too crazy and busy. Along with the gray striped button down I wore a gray tote and leopard heels. This monochrome outfit is a stylish and professional option for the office. Along with answering what to wear with a pencil skirt I wanted to share a few things you should have in mind when it comes to fit. Two important details that you must pay attention to when it comes to a pencil skirt is the length and the fit. A pencil skirt is usually most flattering when the hem ends around the knees. It can be slightly above or below but usually not any shorter. The skirt should also be fitted around the waist and hips but not too tight. If the waistband is a bit too snug and difficult to sit then it’s too tight. You know a piece is too tight when you start to see horizontal lines form across the hips. Fit is critical for work as you want to be comfortable – so make sure the length and fit are perfect so you feel stylish and confident. You shouldn’t have to fuss with your clothes at the office because what you need to be focusing on is the work in front of you. If you wear a high waist skirt or a skirt with a thicker waistband then a blouse would look best tucked in. Personally, I always wear my shirts tucked in when wearing a pencil skirt. 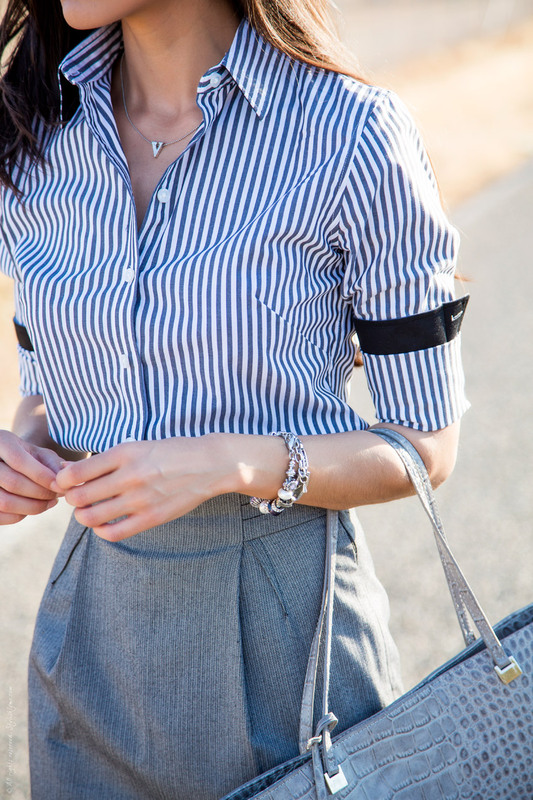 There are many positives to wearing your shirt tucked in: it creates a slimmer waist, makes the look more sophisticated, which is especially appropriate for the office, and for the petite gals (like me) it creates the illusion of longer legs. As you can see from the photos, the gray color palette and vertical lines help to elongate my figure by creating nice long lines. To keep this outfit from looking “stuffy”, I rolled up my shirt sleeves and had the dark cuffs peaking out for an extra touch of attitude. The finishing touch for this wear to work look: leopard heels. The leopard heels help add pattern, color, texture, sexiness, and attitude to this stylish at work outfit. Yes a pair of heels can add so much to an office outfit! On another note, I feel like I need to share this because some mornings you may feel the same way. Getting ready every morning can feel like a chore. Especially when you feel like you have nothing to wear, that’s the worst. Getting dressed in this outfit the other day was hard! My love affair with clothes doesn’t make me immune to feeling like I don’t know what to wear and I get a bit frustrated when I can’t seem to put together a decent outfit. But when you don’t want to “dress nice” is when you especially need to. Remember, “you’re not always going to feel like it but successful people do it anyways.” After huffing and puffing about not knowing what to wear I ended up putting together this very stylish outfit for the office. I know there are many other important things going on in the world but when you feel put together you are more confident and are able to take on anything! Don’t take getting dressed in the morning lightly because it sets the tone for the rest of your day!